So far Julia Kreilkamp has created 8 blog entries. What’s the Big Deal About “Wonder”? Early childhood educators love the word “Wonder.” We talk about a child’s sense of wonder and cultivating that wonder. Books have been written on “The Wonder Years,” and we have famously labeled four year olds as “Wild and Wonderful.” Indeed, every day this wonder in young children — in the form of a ladybug found on the gym floor, a prism rainbow on the wall, newly formed ice on a puddle, the gurgling of water under a grate — sustains us in our work with young children. Our B2’s wonder is contagious! 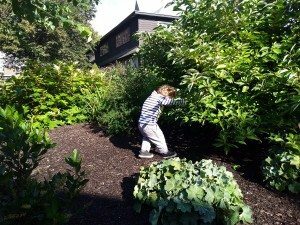 One day I had a little revelation about Wonder that seemed especially relevant to my work with young children. I had driven 1.5 miles over lava rock, on what could barely be called a road, in order to get to an oasis of a beach we had read about in our guide book. At the end of this bumpy primitive road, we were surprised to find a parking lot full of cars, and many people lugging picnics and towels, just as we did. As we ate, I watched a couple of young men snorkeling in a cove near our picnic table. Clearly, they had been at it for a while — wearing full wet suits with various straps and gear attached. After a while, they emerged with a few octopuses hanging from their belts! Before they emerged, I had seen them shed their wet suit shirts and spend several minutes floating and snorkeling in the very shallow reef water. They had been on a fishing expedition, but I didn’t realize until I myself got into the water why they had been hanging out for so long in that cove. I was hot, so I put on my prescription swim goggles and ventured into that water. It was cold and wonderful, so I dunked down. I was immediately surprised and rewarded with three bright yellow fish with black stripes! Wow! I dunked again, and spotted black and white ones! Again, and I saw a large and shimmering blue-green fish. I kept floating and dunking, finding more and more. I lost count of how many different varieties of fish lived there in that little cove. A rainbow of colors, a full spectrum of geometric patterns of all sizes! This silent underwater world absorbed me completely. And I had discovered it! After some time, I left the water to tell my husband about the great surprise I had found. I was absolutely thrilled. But I was also chilled, so I covered myself up with hat and big shirt, and went for a walk down the beach to dry off. I headed towards another cove in the distance that intrigued me. Having to choose between hot lava rock, hot sand, and stony water on my bare feet, I was looking down a lot — so until I was about 30 feet away, I didn’t notice an enormous creature lying on the sand! It was certainly as large as a baby elephant! From my research afterwards, I learned that this monstrous creature was a Hawaiian Monk Seal. These are endangered, and there are only about 1500 of them left on earth. I also learned that they come onto the beach in order to give birth — which was almost certainly why I saw this one there on that lovely beach. And when I told my husband about it, I was not exaggerating — they do weigh hundreds of pounds (even when not pregnant). So what does all of this have to do with young children? This day on the beach reminded me that the thing that makes wonder even more joyfully intense and memorable is the element of surprise, and the sense of having discovered something oneself. When I dunked down into that reef water, I had never been snorkeling before, and I had absolutely no idea that I would see all of those tropical fish. When I set off on that walk down the beach, of course I had not even an inkling that I might run into that awesome monk seal. I felt the thrill of an explorer, and I will forever remember that day. A few days later, we did go on an official snorkeling trip along with dozens of other excited tourists. Somebody taught me how to use snorkel gear, and I stepped off a boat into a huge reef filled with countless tropical fish. I loved every minute of it, but I’m glad that my very first experience with tropical fish was on my own, and by surprise. we took the B2’s on a walk around campus one day. For four long months, the snow had prevented us from trekking down the path and crossing the bridge over the little stream to get to our favorite pine grove and hillside. But now the snow had mostly melted, and as we approached the bridge, a sound stopp ed us all short! The children were hearing a new and mysterious noise! Of course I knew what it was — the little stream from last fall was now a rushing river, cruising over its rocky stream bed. But the children had no idea what that sound was … water??? We walked to the bridge, and wow! 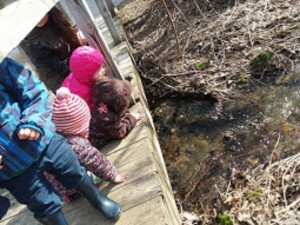 In an instant they became explorers, discovering the magic of a swelling stream. They exclaimed, “WATER!” They watched, entranced. They lay down on the bridge on their bellies to look; they wanted to get as close as possible to that rushing water. 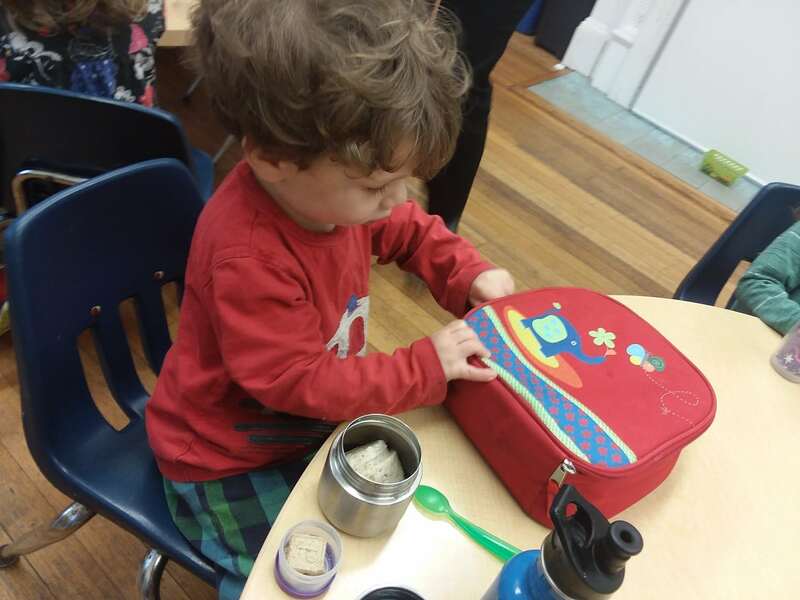 When we work with young children, one of the reasons we provide opportunities for open-ended experiences is so that they can experience the depth of joy and learning that comes from discovering something themselves. There are countless ways we can recreate the “explorer” experience in the classroom. 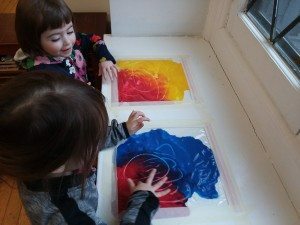 Instead of being told what to expect, or how to use the paints, or what a finished product should look like, curiosity will motivate them to discover these things themselves, and they will create a product (or a process), that is uniquely theirs. Through this opportunity for adventure, they experience surprise, wonder and absorption. They gain confidence to take the risk to try new things — the desire to go on ANOTHER long walk — and the joy that comes from creating something truly their own. 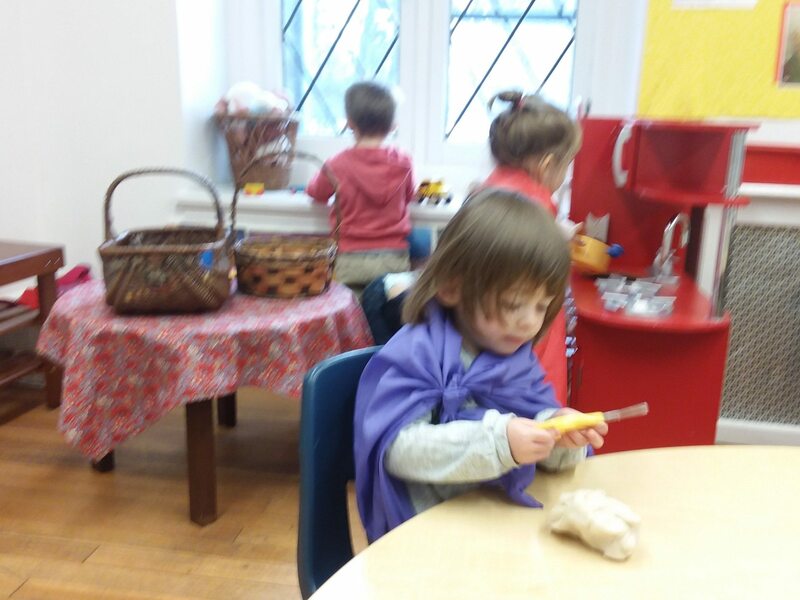 Something old: Last week, I put a new invitation out on a table: freshly made lavender-scented play dough and familiar tools — our play dough scissors and small kitchen knives. Something new: A basket of shiny glass stones, and a basket of small assorted stones from outside. 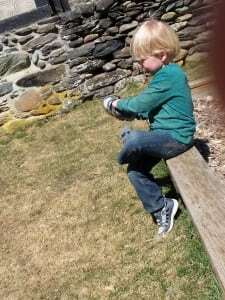 All week the children played with them, enchanted by the feel of the stones — smooth and rough, shiny and dull, of different weights. 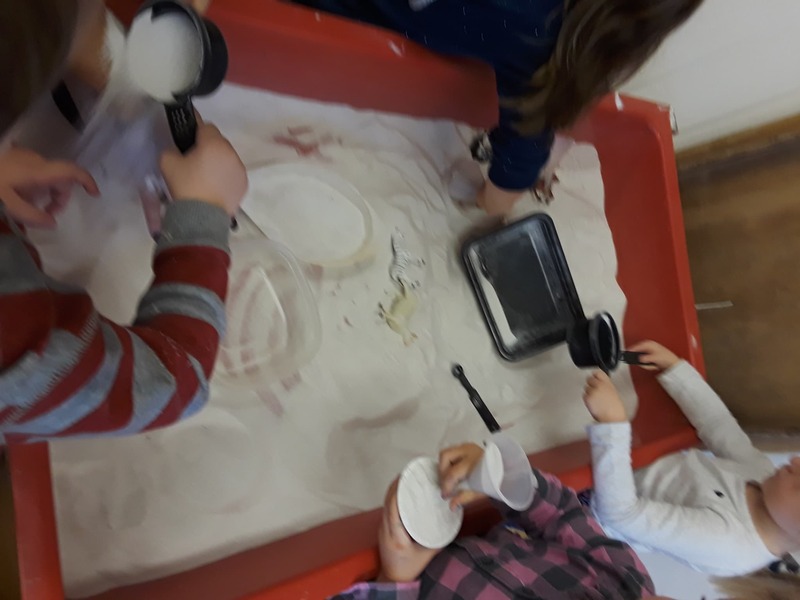 They pressed them into the playdough, hid them in the dough, stacked layer of stones and dough, each child calmed by the lavender, and absorbed in a little world of their own making. Over the week we saw ice cream, burgers, snowmen, islands, an apple, Mickey Mouse, a house, a road, snakes, a rock castle, a cake. 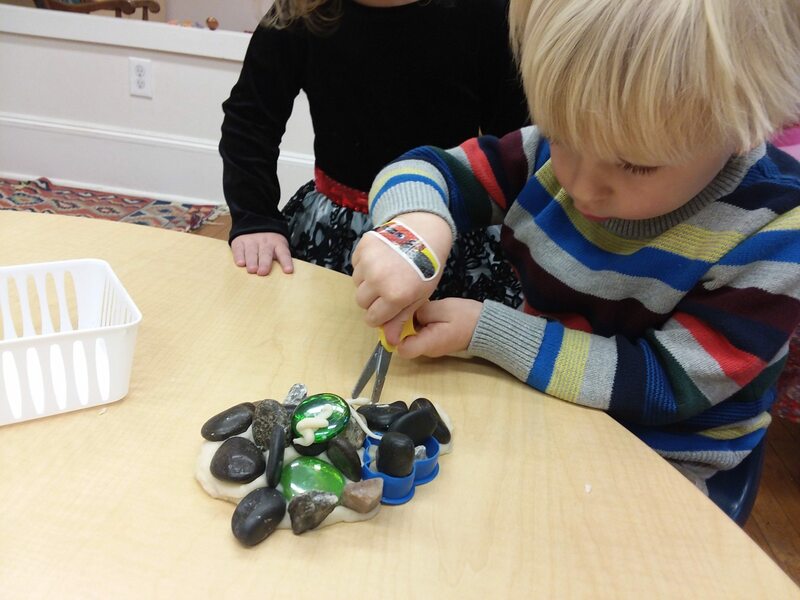 As they played, they talked about their creations; their hands squeezed, rolled, cut, and pinched; they became more familiar with scissors; they talked about colors; they shared stones and tools; they started to notice one another’s creations and became inspired to do more. Once again, for the millionth time, I fell in love with open-ended playthings. Open-ended materials for young children are materials without a pre-determined script. They can be used and manipulated in many ways, limited only by the children’s imagination. 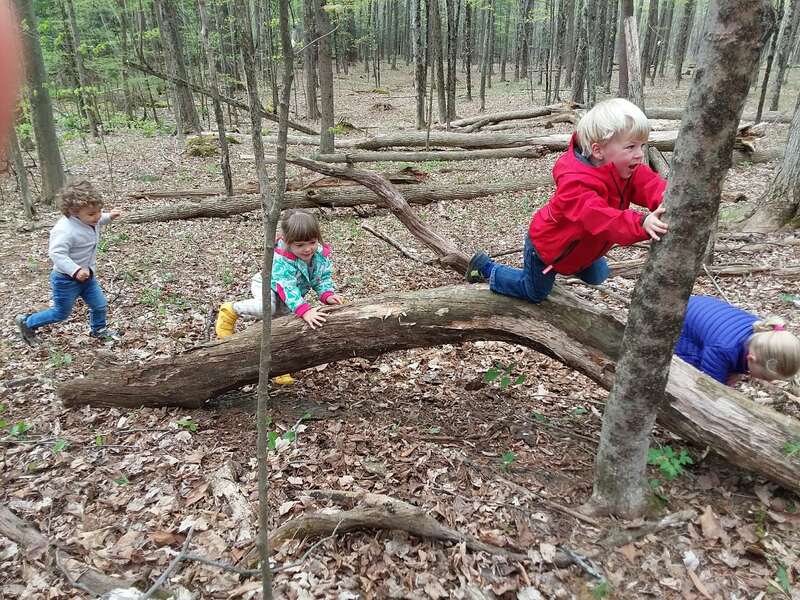 Not only do children practice motor, language, and social skills with them, but they also encourage imaginative play. 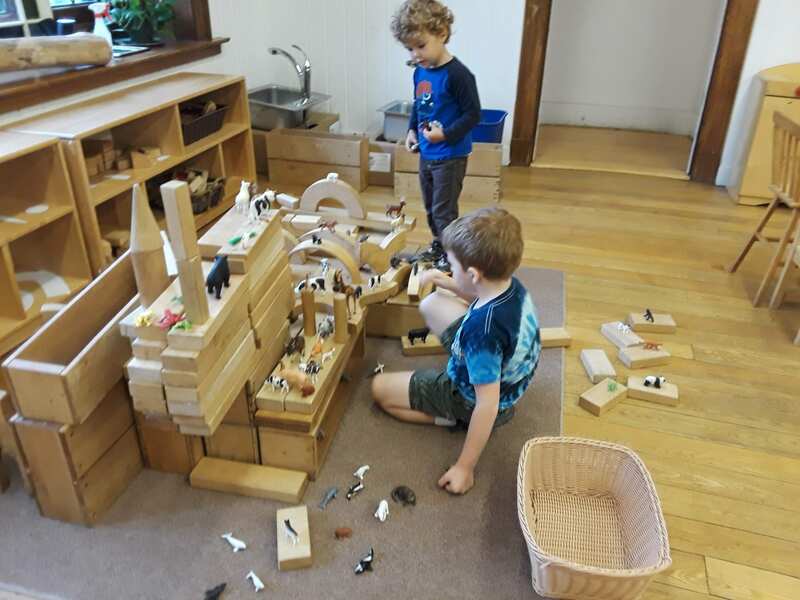 Imaginative play — the cornerstone, the essence, and the driving force of young children’s cognitive, social, and emotional development. 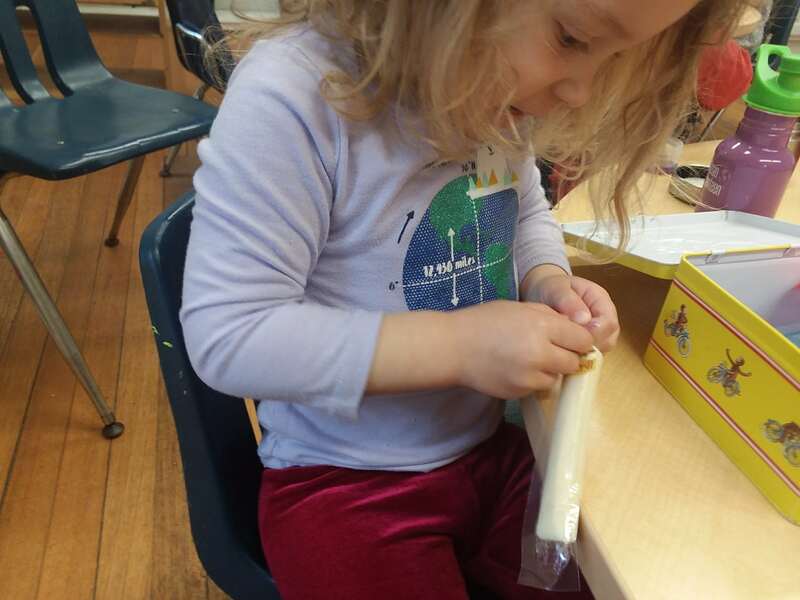 Watching the children so enraptured by the play dough and stone combination, I thought it might be fun to choose another familiar classroom open-ended material and reflect on its many uses. One of the most important objects in our classroom is our basket of brightly colored silk scarves. 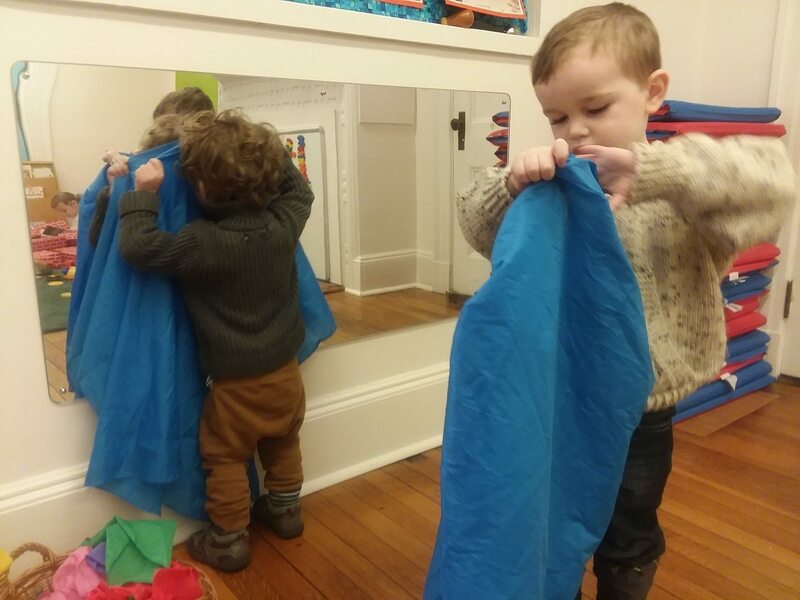 How does a simple silk scarf make its way through the school day of our two- and three-year-olds? Under the scarf, we hide ourselves, toy animals and little people, a drum, a block, a ball! Even more fun, we hide each other! We dance, parade, wiggle, and shake. We wave the scarves high and spin them around us. We run across the gym with them, flying like the wind! We use it as a blanket for ourselves–and for our babies! We hide UNDER it. We pass it THROUGH our legs. We drape it OVER us. We sit ON it. We wave it AROUND us. We wave it ABOVE us. We put them IN the basket. We look through it and see the world tinted in color. On a picnic! (the scarf is our blanket) To the beach! (the scarf is our towel) To the store! (the scarf is our coat) To the rescue! (the scarf is our cape). We use the scarves to swaddle them, and to lay over them on their beds. When we wave them hard, they make a little “snap.” When we cover the big drum with them, they muffle the drum beat. They flutter over our faces and our arms. They feel soft on our skin. 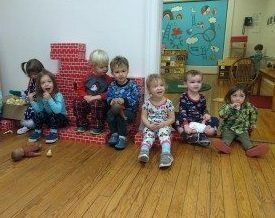 Sometimes while wearing their scarves, the children go about their business, cooking in the play kitchen, drawing, or playing in the dollhouse. 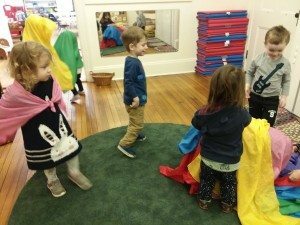 At these times, the scarves are like Superman’s transforming cape, empowering the children with greater focus and imagination, and enabling their young brains to soar! What does a veteran elementary and early education teacher do over Winter Break? I reveled in Ireland’s beauty and history, and its friendly and gracious people – truly, every shopkeeper and pub waiter, every bus driver and ticket-taker, had a smile and friendly word, and often a story or two to make us laugh. And I also read the book! The LeVines, respectively a professor of education and human development and an anthropologist, have spent a lifetime studying child-rearing practices in diverse cultures across our globe. 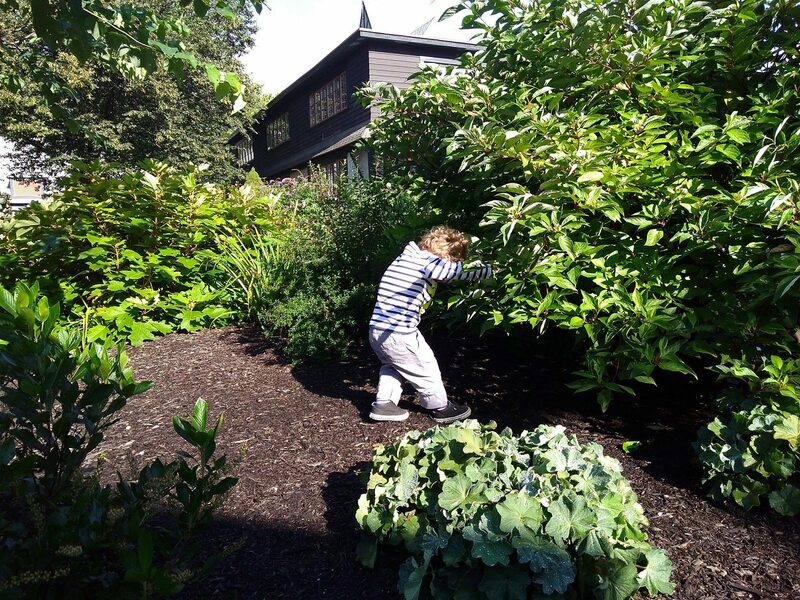 In general, they have found that children can be happy and healthy in a wide range of conditions, and guided by a wide range of parenting practices. 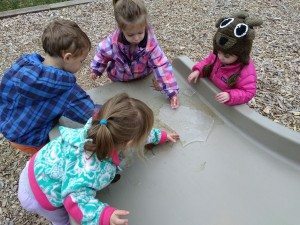 In my new professional challenge as a teacher of two-year-olds, this book was most helpful to me by opening my eyes further to this point: “The behavior of toddlers in highly responsive to their parents’ priorities.” How do we use a Reggio-inspired philosophy to bring cohesion to this diverse group? How do our school priorities influence the behavior of these young children entrusted to our care? 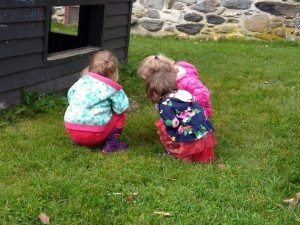 As I traveled around Ireland, I thought about how Irish children observe and hear, from infancy, the adults in their lives engaging with strangers with politeness, humor, and friendliness. They also attend schools financed by the government and managed by the Church, with all of its attendant values. They share a strong and clear historical identity. 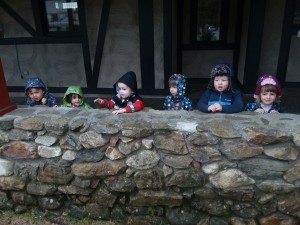 Before heading to Ireland, as I reflected on my first months of life with our B2 classroom, I felt truly in awe of how strongly the children had become a community. They announce the arrival of their classmates with gusto, greet each another with a hug or at least a smile, notice when somebody is sad, and offer a truck or an animal to share. 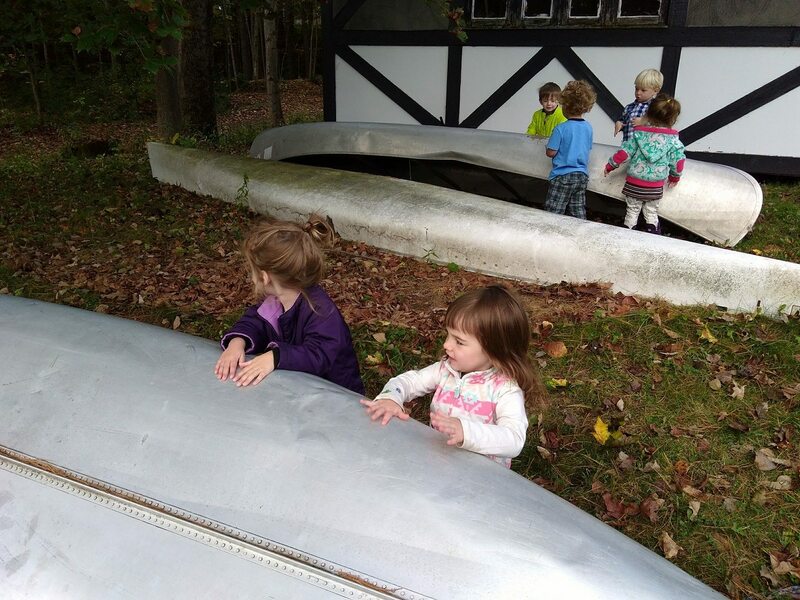 In October, when I first observed a group of them engaged in interactive play, initiated on their own, I was amazed. “This is not typical two-year-old behavior,” I thought. But then I observed it more and more – in pairs and in small groups, the children were “cooking” together, hiding together, driving to the beach together, coordinating their movements as they ran with a hoop, assigning family roles, and on and on. 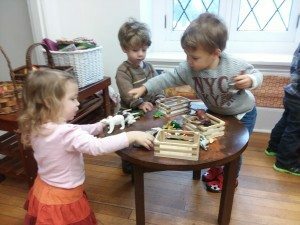 We arrange the day’s routines and the environment to support opportunities for cooperative play. A round table is regularly covered with communal paper, where the children gather and experiment together with paints and other art materials. 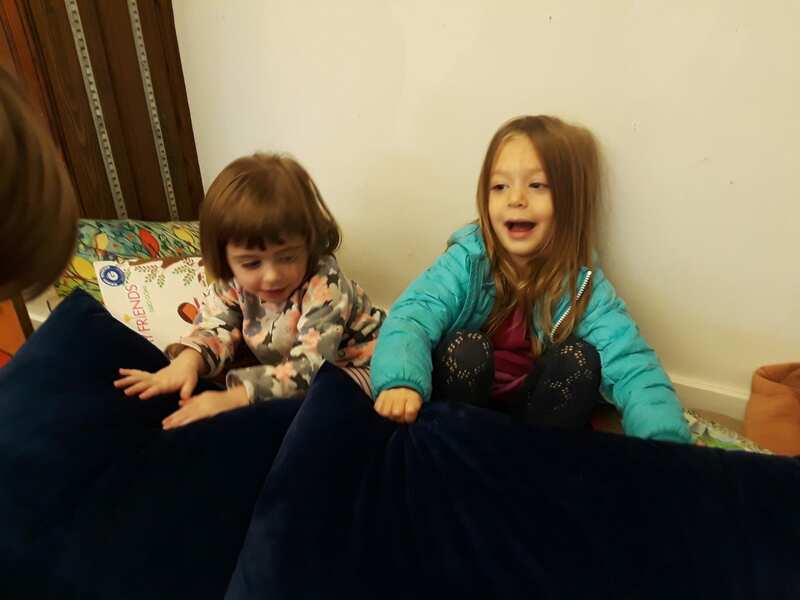 A comfy floor cushion is large enough for four children to sit together with books. 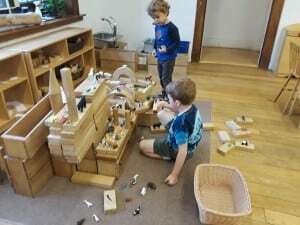 A dollhouse sits on a table where children can access it from both sides, and play opposite each other. Percussion instruments are usually used on a round rug, which encourages circle movement and communal drumming. Over the first weeks of school we ventured out on daily walks around our campus. These walks had no purpose other than for everybody to explore their new environment together. 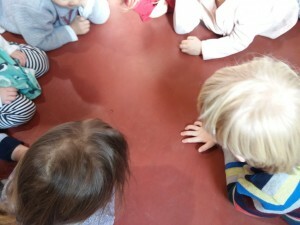 The children gradually learned to travel as a group. The quick ones had to wait for the slower ones. The ones who loved to wander learned to come when called. When somebody fell, the others noticed and announced it with concern. When one child discovered something fun or interesting – a pile of leaves, a bench to climb on, a fence with holes – classmates gathered. It’s not always easy – to wait, to share, to disagree. But through hours of shared experiences, and with encouragement to be caring, friendly, and inclusive, these two-year-olds have often pushed past the comfortable realm of “parallel play” and into the often messy but rewarding experience of group play and teamwork. Just as the Irish children absorb their cultural heritage of helpful and gracious hospitality, our two-year-old children have made a strong start in absorbing BCD’s priority of a supportive community. 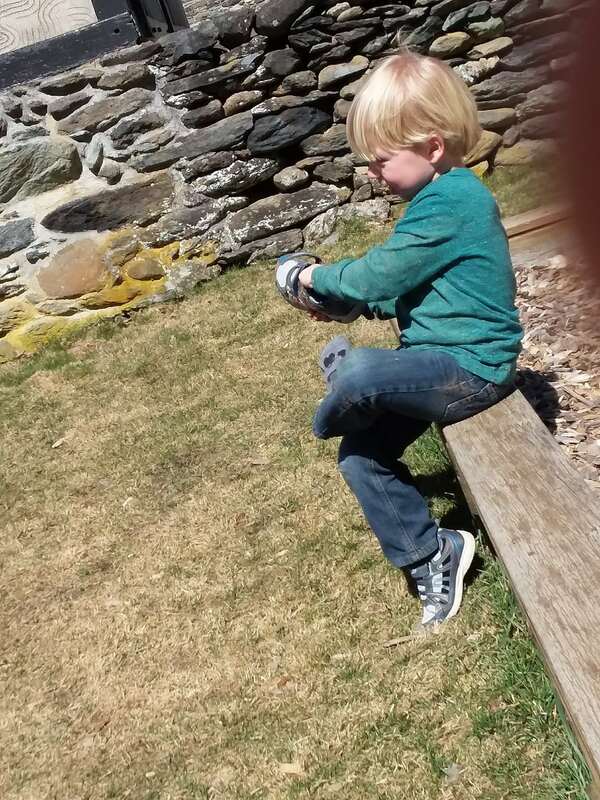 When young children are outside, everything is exciting. Interesting sensations and challenges surround them. 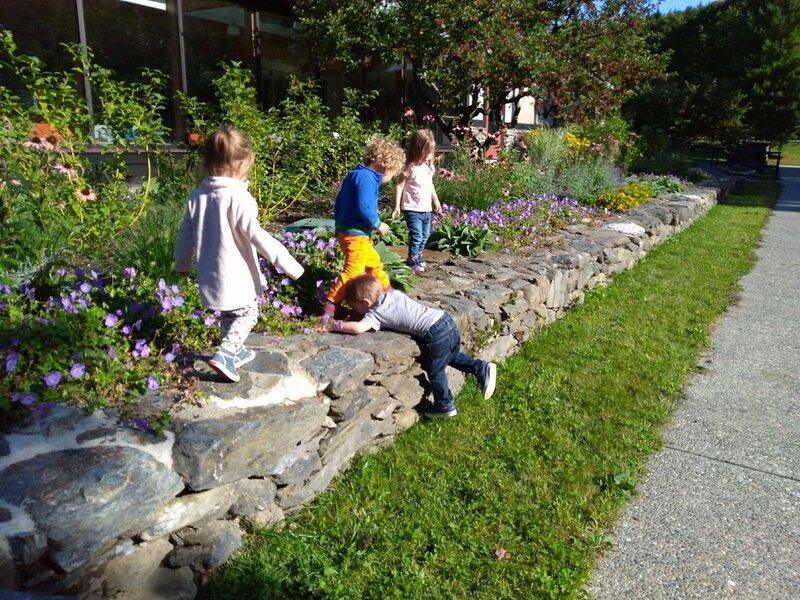 Reggio Emilia philosophy identifies three teachers of young children: family, school teachers, and the environment. 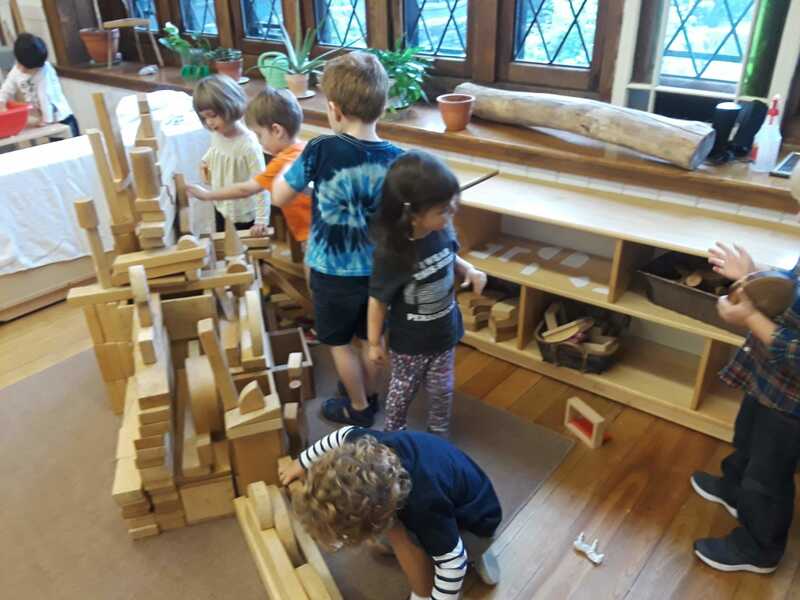 Certainly we pay attention to designing and adjusting the classroom environment to foster children’s curiosity, focus, and social growth. The outdoors is also an integral part of the life of a Reggio-inspired classroom, and at BCD we are lucky to be able to step outside and have such a wonderful array of experiences for the children. Up! I DID IT! Bug! Plane! 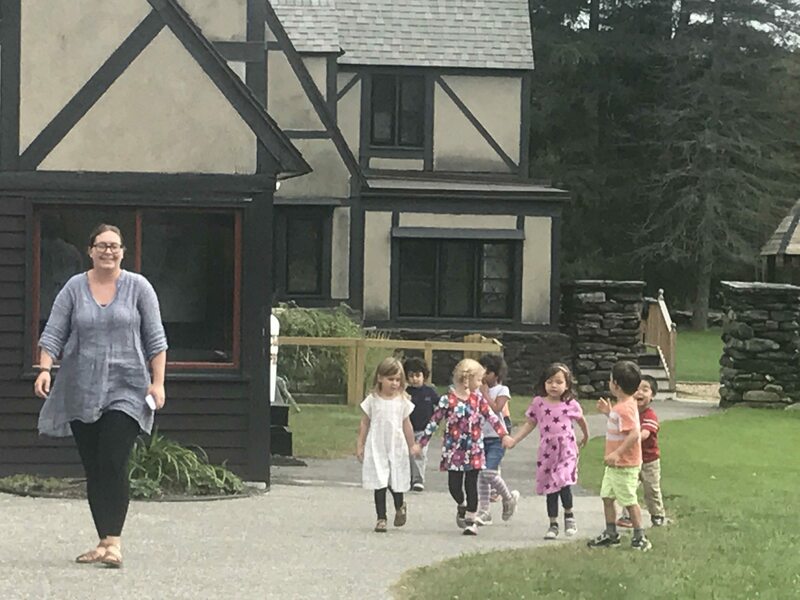 During their first seven weeks at BCD, we spent a lot of time outdoors with the two year olds, exploring our wonderful campus. 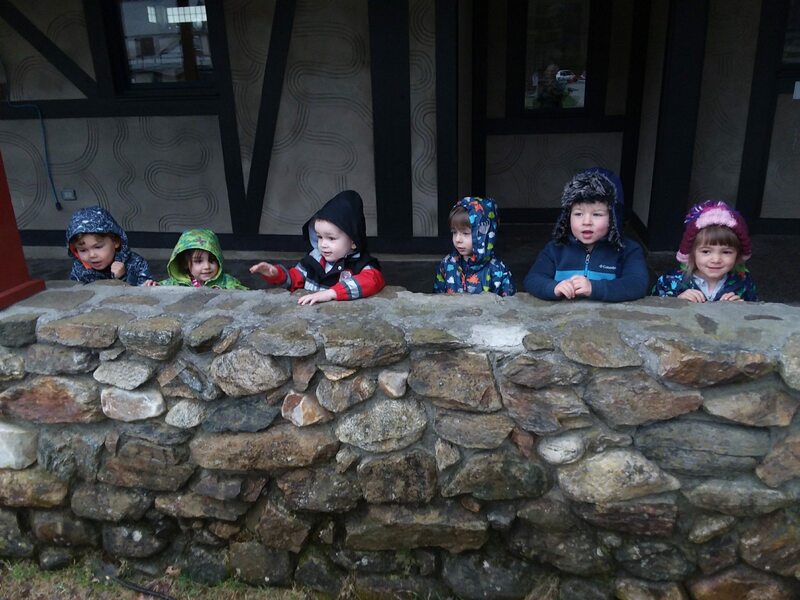 The children learned to climb stone walls, ladders, and benches, and gained confidence in jumping. They have found and observed spiders and bees; examined rotting apples; felt the wet grass; made pillows of pine needles, and banged and drummed on overturned canoes. They run down hills and climb back up. 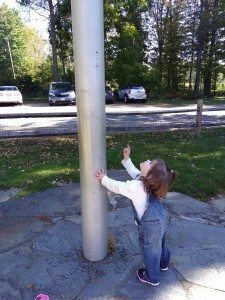 They look UP — at low and high flying airplanes, at the flag on the flagpole, at birds and butterflies, and through the branches to the tree tops. They have dug in the sand, lain in piles of leaves, hidden in bushes, and splashed water. At the heart of the Reggio Emilia philosophy is an emergent curriculum which builds on the interests of the children. The curriculum is not pre-planned by the teachers. It is flexible and originates from the children’s thoughts, ideas, and curiosities. 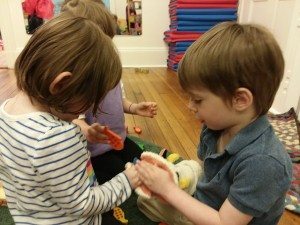 We observe the children carefully, watching them play, discovering their interests, and listening to them talk. Topics for study are captured from these observations. 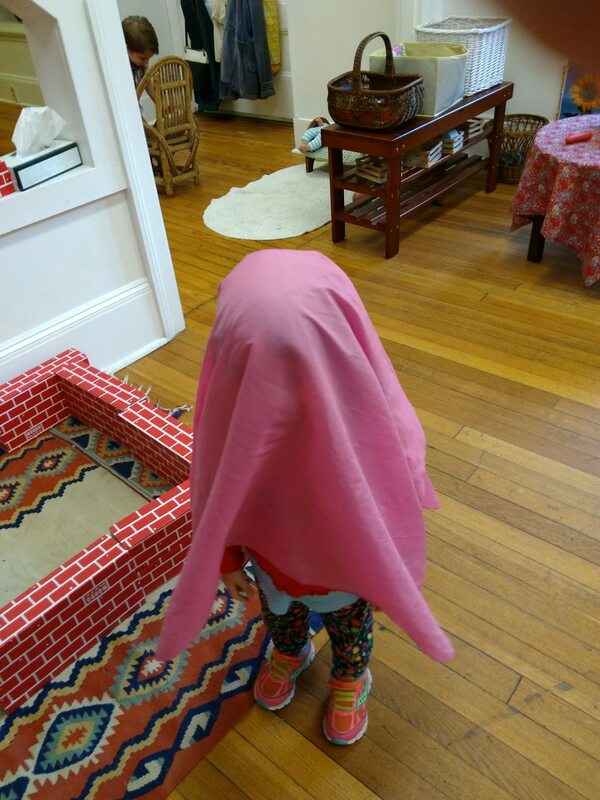 Very quickly in our two-year-old classroom this September, we noticed that the chi ldren loved to find places to hide. In a walk around campus during the first week of school, the children turned a big bush into a hiding place; they found apples on the ground and started to hide them in a hole in the apple tree; they draped a silk scarf over their heads to hide from us. We noticed their love of hiding places and began to invite them to explore other ways of hiding, and also ways they could hide objects. For example, we placed a large cardboard box in the room one morning. We hid shells in the sandbox. Another day, we hid small animals under larger shells in the sand. We draped the scarves over the balls in the gym. The children started to find new ways to hide objects and to hide themselves: animals hid in the stacking boxes or in the play kitchen; the children crawled under a runner rug to hide. As well, the hiding provides a multitude of opportunities for social interaction. 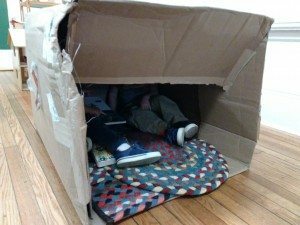 The children snuggled up together to hide in the box. They delighted in “finding” a new friend under the scarf. Soon they were in cahoots together hiding in the rhododendron bushes outside. They seemed to learn one another’s names more quickly because of the hiding project. 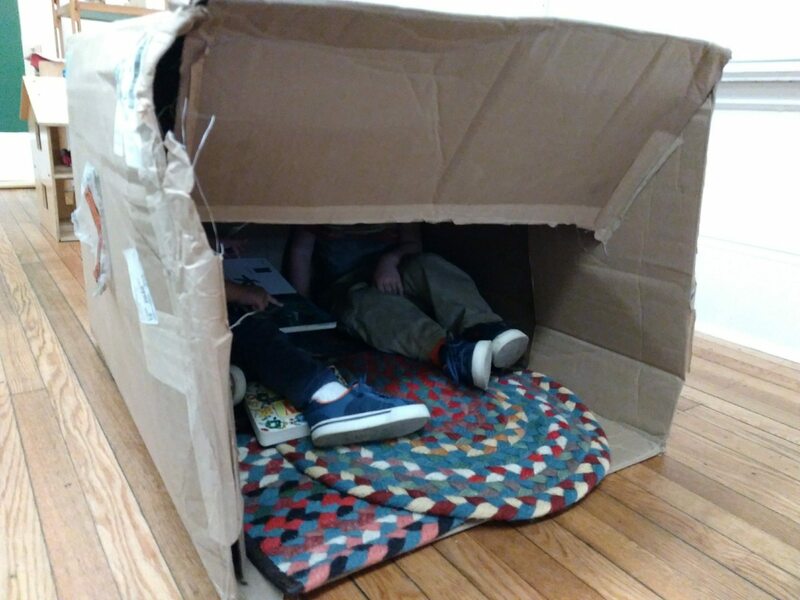 Our classroom community grew stronger and richer because of our shared experience with hiding places. 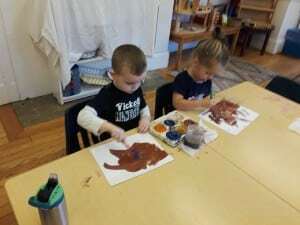 Recently in the 3s/4s Preschool class, there has been a growing interest in drawing treasure maps. We took that interest and began to explore the possibilities. 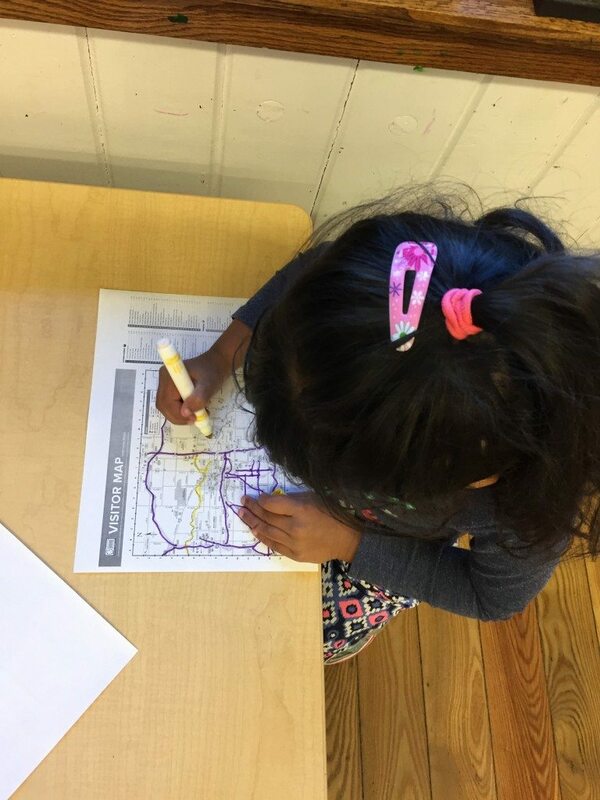 We started by putting out maps and letting the children look more closely at them, draw on them, discuss them. We talked about why maps are important, why we need them, and what they are for. Ms. Junod and I have been offering several possible directions for this study to take, materials to facilitate this, and opportunities to help the children think deeper. 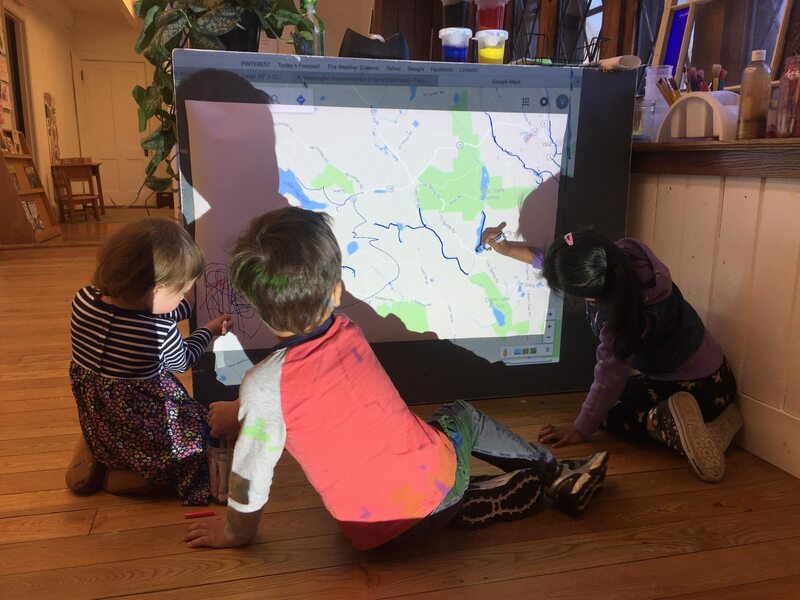 In the beginning, the students were given an invitation to explore maps. Blank maps were put on the table with markers and magnifying glasses. 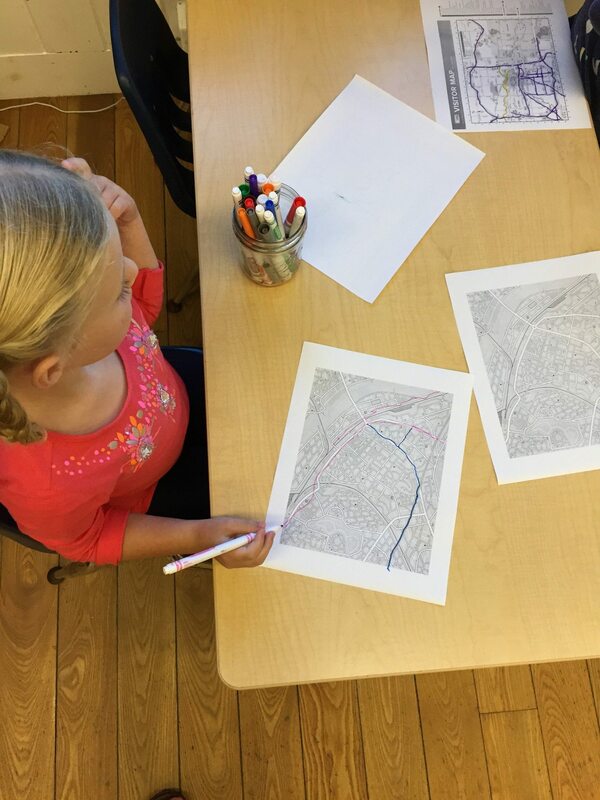 Students decided that they would trace the roads. Some added houses, some drew in schools. There were toy shops and airports, trees and lakes. Their maps were coming alive! In a meeting, we discussed why we have maps and what maps tell us. The children said that “maps show water where it is blue,” “they can tell you how to get to a toy store,” “you can see airports.” Through their play with maps, the children are working on spatial relationships skills, as well as language specific to maps (such as directions and geographic terms) and general language in our lively, interactive discussions. While studyin g maps, we have also been finding ways for the class to build community and learn how to work together as a team. A week into our Map Study, we set up a treasure hunt, starting with a map of the school and a big “X” marking “the spot.” The students had to figure out how to find the “X.” Ms. J and I guided the class in ways to collaborate, including how to problem solve as a group and take how to turns. Finally, after a lot of discussion, the class worked together, followed the maps, and successfully found all three “X’s”! Every year we explore new topics, every year there are new and exciting things to learn. Stay tuned!